Otoscopy is one of the most difficult skills to learn to perform in infants and toddlers, and it is also one of the most important because these are the ages when otitis media is most prevalent. *The pinna is pulled down until a child is about 4 to 6 months of age; afterwards, pulling up, as in adults, usually provides the best visualization. Figure 24-36 Positioning of examiner's hands for otoscopic examination. Note that the little finger of the hand holding the otoscope is braced against the child's head. (The examiner is left-handed.) The first two fingers of the other hand retract the pinna, while the remaining fingers are wrapped around the bulb of the insufflator, prepared to squeeze the bulb if the examination warrants. examiner's hands and otoscope move as a unit, and there is less risk of inserting the speculum too far into the canal. Always use the largest speculum possible, which should be introduced slowly into the external canal. Figure 24-36 demonstrates the positioning of the examiner's hands. Notice how the hands are braced against the child's head, as well as the correct position for holding the pneumatic bulb. The tympanic membrane should be easily visualized unless cerumen is present. Any cerumen should be removed by someone experienced in doing so. 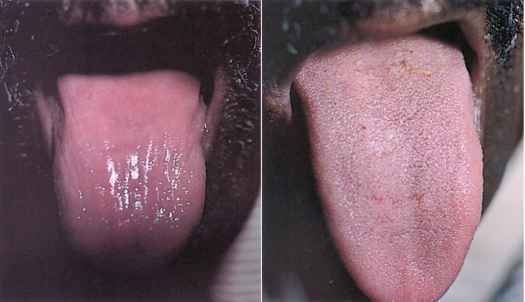 Is the tympanic membrane erythematous? Is it bulging? Check for a light reflex. Its presence, however, does not rule out otitis media. Are air-fluid levels visible behind the drum? These signs are suggestive of fluid in the middle ear. 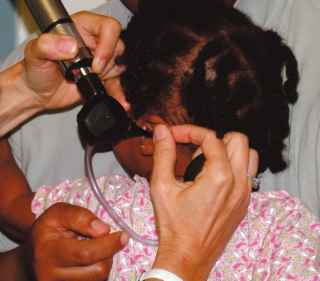 Pneumatic otoscopy (see Chapter 11, The Ear and Nose) is an important skill for detecting mobility of the ear drum. In many young children, the ear drum may be red from crying or fever without middle ear infection. Decreased mobility is indicative of middle ear fluid, which is characteristic of otitis media;the presence of pus behind an immobile ear drum (opaque yellow fluid) is the best evidence of bacterial otitis (see Fig. 11-29). Figure 24-37 shows the ear specula designed to facilitate pneumatic otoscopy; the flared portion near the tip is coated with soft rubber to provide a seal without traumatizing the ear canal. The speculum on the left is the regular one; the one on the right is used for pneumatic otoscopy.